Owen Sledding in our neighborhood, originally uploaded by bill kralovec. With all of the snow we received last week and the cold temperatures this weekend, conditions are perfect in Belgrade for sledding runs. Last year, we had to go over to Banavo Brdo (Ban’s Hill) which is a neighborhood on the other side of Kosutnjak park. This year, there is a sledding run 100 meters from our house. The street is blocked to cars with two large garbage bins. A bunch of kids were there yesterday afternoon. 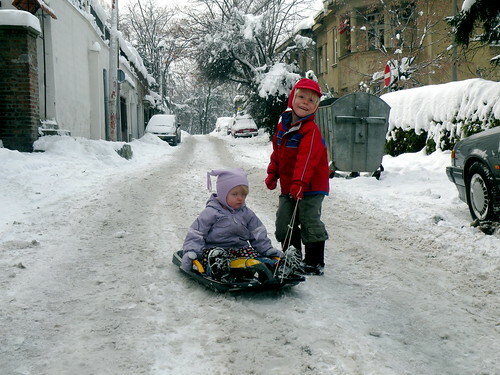 I took the kids over with a toboggan we bought in Slovenia last year. Owen and Ollie loved it. Ocean didn’t as she was a bit scared. Above is a video of one of Owen’s run. If you listen closely, you can here Nadia in the background. We’ll head back today for another run. It was a nice Sunday. I went for a long run in the morning and cooked a hearty pancake breakfast. We went grocery shopping in the late afternoon. We finished off the night with dinner and watching Mythbusters and Atlantis.